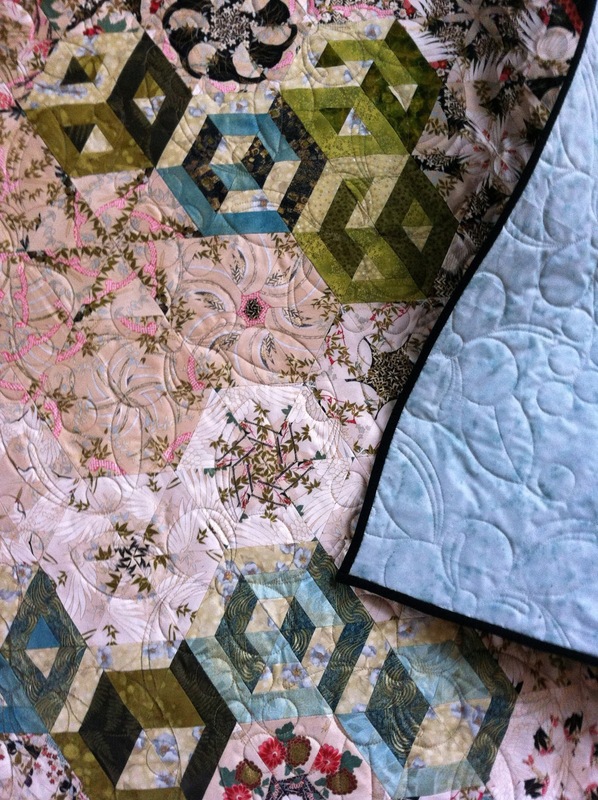 Some quilts are completed quickly and others need time to percolate and age before they are finished. 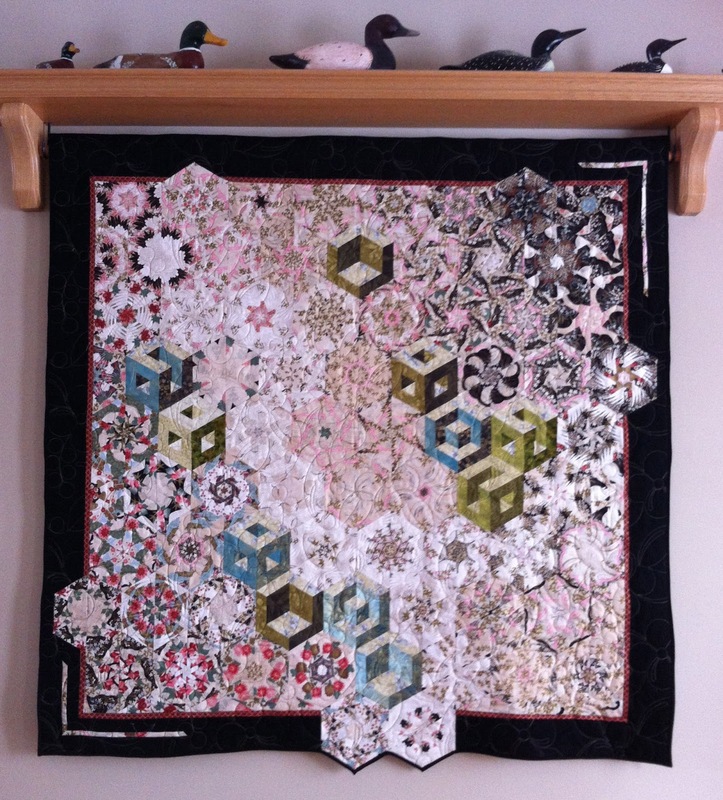 This one block wonder quilt was one that needed time. I rarely take classes, preferring to spend my $ on fabric than techniques I can learn online or through a book. 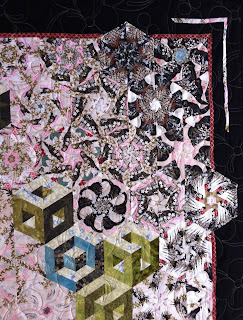 My local quilt store, Along Came Quilting offered this class a few years ago and I loved the sample and signed up! The first part of constructing this quilt was the hexagons that are made from little triangles. 6 layers of fabric were layered so that the pattern was matched on all 6 layers. With a new blade in the rotary cutter, strips were cut and then triangles and each set of six identical pieces were pinned together so they wouldn't get mixed up. The second part was the 3-D blocks that are set into the background of kaleidoscope hexagons. These were fun to make, but difficult to incorporate into the background. There was a lot of playing with pieces on the design wall to come up with a final design that was pleasing to the eye! 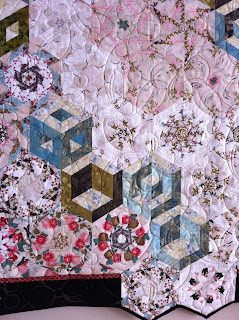 But, finally, all the pieces were sewn together and I wasn't please with how it looked at that time. So off to the back of the closet it went to age. 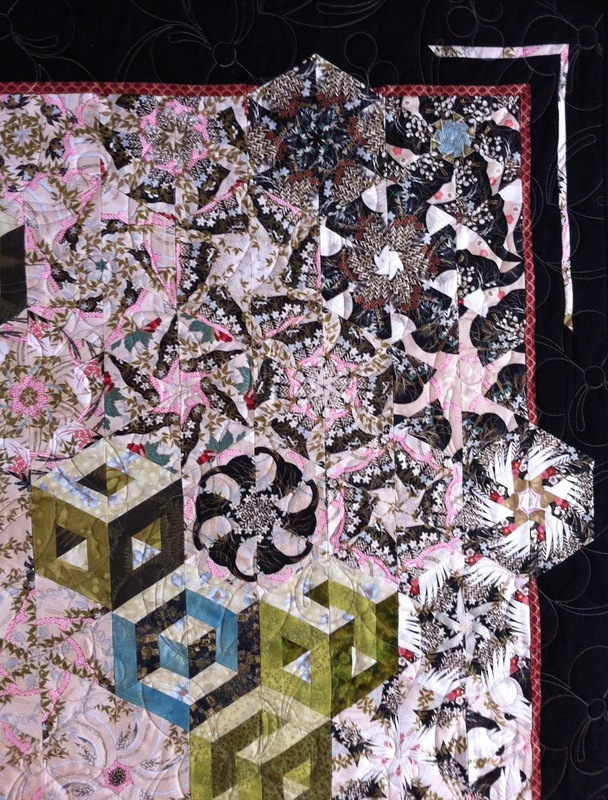 I took it out again recently and took a few seams out and redid it so the blocks flowed out into the borders and now I'm so happy this one is done! I still have a piece of fabric in my stash that was meant for another one of these. . . I wonder if it will take as long as the first one! Do you have a project that needed time to age before finishing?